Scientists have developed a method to get an order of magnitude improvement of light emission in 2D materials. The method is known as photonic hypercrystals, could transform low-light-emitting TMDs into much brighter sources of light. When 2D material is placed on a photonic hypercrystal, it then raises large light improvement. Researchers ascribe this large light enhancement and concentration to the unique properties of photonic hypercrystals. Thus it has the ability to combine optical properties of both photonic crystals and hyperbolic metamaterials. In recent years, 2D materials have attracted lots of attention. This is because their atomic-scale thickness causes irregular electronic and optical properties. Thus, it makes them potential candidates for future optoelectronic devices. 2D TMDs are specifically attracting because they immediately emit light because their direct band gaps. This allows electrons to directly emit photons. But now, 2D TMDs don’t generate enough light to make them useful as practical light-emitting devices. Scientists have designed a photonic hypercrystal by designing periodic structure of holes in a hyperbolic metamaterial. 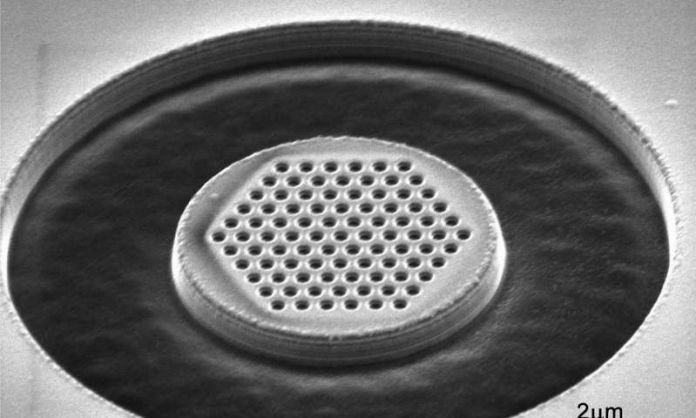 Each hole measures about 100 nanometers in diameter. When 2D TMD material like WS2 or MoS2 flakes placed on a photonic hypercrystal, TMD generates light. The generated light is then enhanced because of a large number of photonic states inside the hypercrystal. 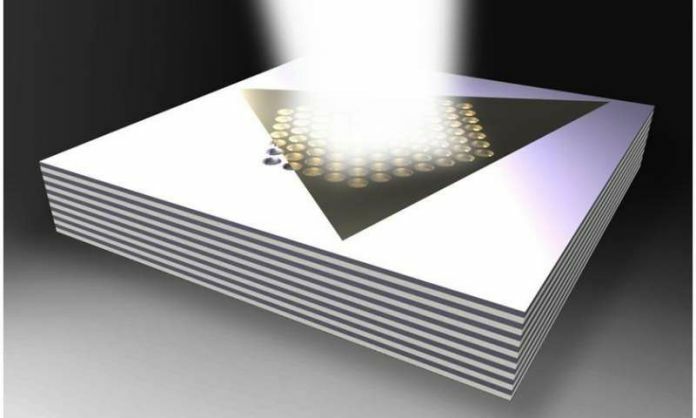 The coupling generates light intensity 56 times greater than its reference substrate and 7 times greater than it is on a hyperbolic metamaterial. This is only for WS2 flakes. The design also concentrates the emission because it can be the focus in a particular direction. The periodic structure of holes aids as the photonic crystal. The period enhanced to allow high-momentum light to pass through. The hyperbolic metamaterials get their name from the hyperboloid shape of dispersion in the metamaterial. By combining the properties of both materials, photonic hypercrystals are strong light emitters like hyperbolic metamaterials. But the light adjusted and controllably scattered as in photonic crystals. This combination enables an unprecedented degree of control and enhancement of light propagation. According to scientists, this method could use to develop practical optoelectronic devices made of 2D TMD materials.